Like all industries, business has its own set of terms. Since learning about and understanding how businesses work is crucial to success, even as a small one-person run business, it's important to know these terms. One such term is Return on Investment, or ROI. Return on investment represents the financial benefit received from an investment. Basically, it's a measure of what you get back compared to what you put in. It's used in many areas of finance, as well as in business. In business, it's most often used to determine the effectiveness of marking, although that's not the only area you can measure ROI. Other business investments, such as equipment and services should have a favorable ROI. When it comes to ROI, your goal is to have maximum return for minimal investment. You want to get more back than what you put in. The goal is to have a high ROI. It is usually represented as a ratio and obtained by dividing the gain earned from the investment by the investment amount. For example, if you spend $1,000 per month for Pay Per Click (PPC) advertising and generate $2,000 in revenues directly from your PPC campaign, you divide $2,000 by $1,000 to get $2. The ROI would then be $2 or 2 to 1. In other words, for every $1 you spend on PPC ads, you earn $2. 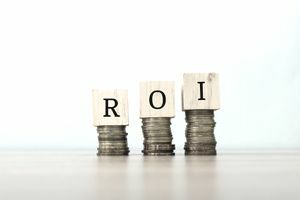 You should measure ROI on all your marketing efforts so you can be sure to spend your time and money on activities that generate the best results. However, you should consider ROI or benefits of any expense you have. How much will a new, faster computer contribute to your business? Does the money you spend on a virtual assistant lead to your ability to earn more than if you didn't have her? Further, while ROI is generally attached to financial investment, it doesn't hurt to consider time as an investment. If you're making $3,000 per month, but working 60 hours a week on your business (240 hours a month), your ROI is $12.50. For every hour you're working, you're only earning $12.50 ($12.50 per hour). Calculating ROI can help you understand what's working and not working in your business so you can make changes. If your PPC ad isn't generating a profit, then you're losing money. Knowing that would then prompt you to either change the ad to improve ROI or ditch it all together. The same is true when calculating your time ROI. Using the example above, odds are you don't want to work 60 hours a week, and certainly not for $12.50 an hour. Knowing how well your time is converting into income can give you the info you need to make changes, so you can work 30 hours a week and make $25 per hour without losing income. Of course, starting out, you will likely put in a lot of time for little to no results, but your goal is to change that; so you can work less and earn more. The difficulty in calculating ROI lies in how well revenues (what you earn) can be tied to a specific investment. For example, if you use search engine optimization (SEO), you may not be able to accurately determine how much an increase in your revenues was a direct result of SEO because other factors (i.e. social media) may also have led to increased traffic. Social media, in particular, can be difficult to measure, although there are tools that can help. Facebook offers insights and many of the social media management tools, such as Hootsuite, also provide analytics. But even then, it can be difficult to know if clicks from social media led to sales. Further, in most cases, customers and clients don't spend money on their first encounter with you. Perhaps they find you through a PPC ad, then they follow you on social media, next they sign up for your email list, and then they buy. The question is, which led to the sale? You could argue the PPC did because it introduced the prospect to you, but it's possible a Tweet or email led to the actual buy. Additionally, because you're dividing by your expense, if you engage in a free promotional activity that results in increased sales, the denominator would be zero, which results in a mathematical error. For example, if you earn $1,000 from the result of an Instagram post, the math is $1,000 divided by 0, which is 0. Normally, a zero ROI is bad, but in this case, it's good. You made money without spending money. With that said, free marketing often involves the personal investment of time, which does have a financial value, and you can use that to determine ROI. For example, if you know your time is worth $50 an hour and you spend an hour a day on Instagram, you can divide the income earned from your social media efforts (if you can decipher that amount) by $50. Anytime you invest money (or time) into your business, you need to have a goal result in mind and way to measure it to ensure you're making a profit. Ask yourself, "What will I earn by investing this time and money into my business?" For example, if you outsource work to a virtual assistant, is the money you're paying to a VA leading to an increase in income and if so, how much (ROI). For every dollar you spend on a VA, what extra returns (income) are you getting? ROI isn't static. Many variables can change your ROI. For example, even if you don't change anything about the PPC ads, it's possible they could drop in ROI (not perform as well) or improve (generate better results). So you want to calculate ROI regularly and make changes to your investments as needed.